Hedgeye Risk Management made waves last spring and summer with their attention-seeking campaign against Linn Energy LLC (NSDQ: LINE), which the research outfit described as “the best short in oil and gas today” and assigned a “fair value” of $8.10 per unit. This coordinated smear campaign included plenty of jabs on social media and several articles in Barron’s, a publication widely read by individual investors. 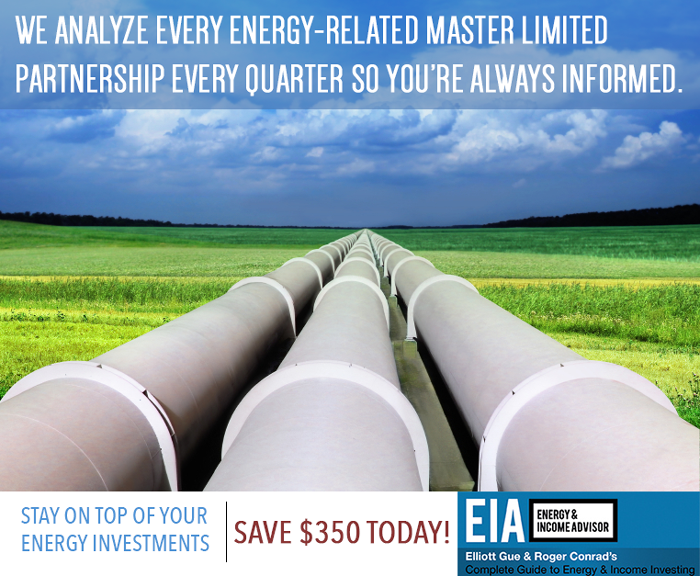 Linn Energy’s subsequent disclosure that the Securities and Exchange Commission (SEC) had launched an informal investigation into the oil and gas producer ostensibly validated Hedgeye’s argument and sent investors rushing for the exit. Linn Energy’s stock tumbled to $20.35 per unit at the height of investors’ panic. However, the completion of the firm’s complex acquisition of Berry Petroleum—a groundbreaking deal that marked the first time an upstream master limited partnership (MLP) acquired a C corporation— ultimately boosted the market’s confidence in the stock. But how have these attention-grabbing short calls fared? Although LinnCo LLC (NSDQ: LNCO) has remained underwater since Hedgeye Risk Management’s short call in March 2013, the other MLPs that the firm has criticized have delivered an average return of 20 percent. That is, short sellers would have lost money. In fairness, Hedgeye Risk Management issued these calls via press releases to the popular media; one would hope that the firm’s paying customers received timely entry and exit dates for these positions. However, Hedgeye Risk Management’s aggressively low valuations of these stocks and dire warnings of significant downside led unsophisticated investors to believe that these names were headed for a freefall. Fortunately, the total returns posted by these stocks suggest that rationality won out over hyperbole. Of course, these unsavory media campaigns gained Hedgeye Risk Management invaluable attention and, one would imagine, an influx of new subscribers. We believe that providing high-quality analysis that helps readers to outperform the market builds a more sustainable business than fear-mongering; these principles underlie Capitalist Times Premium, Conrad’s Utility Investor and Energy & Income Advisor. Contact us for free sample issues of our publications; we feel confident that you’ll agree. Hedgeye Risk Management leveled serious charges against these MLPs, including misleading accounting that masked unsustainable business practices. One reason that these arguments resonated with retail investors: The research firm backed their sensationalist assertions with numbers from the companies’ financial statements—a place far too many investors don’t go. 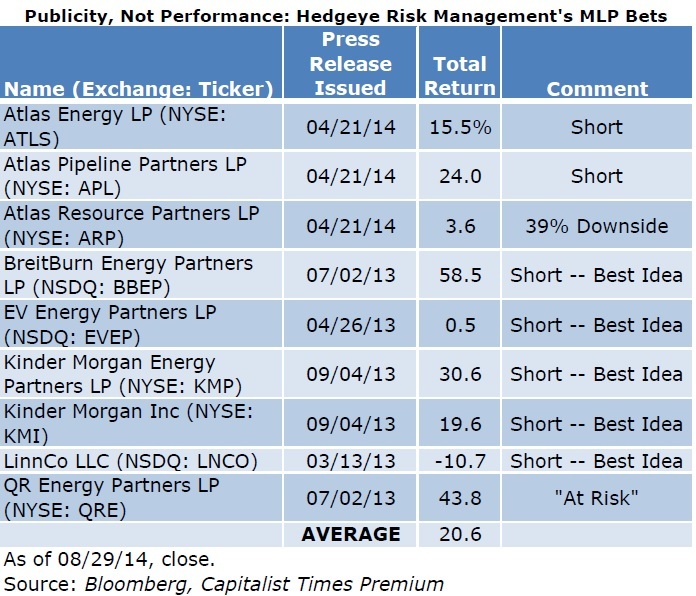 Some dismissed Hedgeye Risk Management’s work as that of inexperienced upstarts. We took their charges seriously and went to work to see if their claims held water. What we found was nuanced. And in fact, some of the research firm’s points were worth following up. Ultimately, however, we maintained our ratings on all these publicly traded partnerships—Energy & Income Advisor covers every energy-focused MLP—and regarded Hedgeye Risk Management’s warnings as overblown. Short sellers who blindly followed Hedgeye Risk Management’s advice weren’t the only investors to take a major hit by betting against the wrong dividend-paying stocks this year. In a number of instances, short interest reached levels that suggested a great deal of dumb money had followed the crowd—at which point the risk of a short squeeze can make these stocks a contrarian buy. Part of this strategy is simple mathematics. The only way short sellers can close their positions is by buying stock; if good news prompts enough short sellers buy at the same time, the volume squeezes the stock price higher. Successful short sellers make their money by placing bets before the stampeding herds. The dumb money, on the other hand, usually piles in after the stock has already fallen. At that point, the consensus expectations for these companies are often at their nadir; unless the target is in real trouble, the low bar makes it easier for these names to surprise to the upside, triggering a short squeeze. 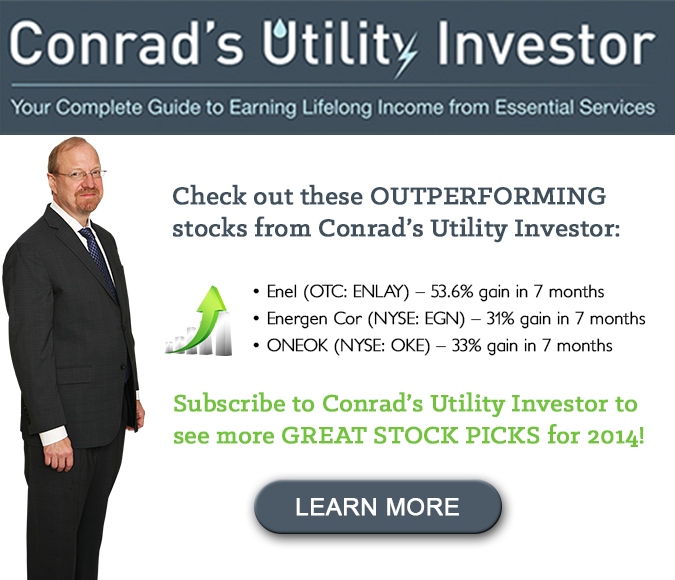 This strategy has worked wonders this year in Conrad’s Utility Investor, where several of our contrarian bets have delivered big gains for investors. In each case, these names were on their way to overcoming real challenges; we bet that improving results eventually would help these beaten-down stocks to turn the corner. Take regional telecoms, a heavily shorted industry at the start of 2014. A wave of dividend cuts in recent years had lowered expectations for these names. However, investors who blindly piled into this trade failed to recognize that the catalysts behind these dividend cuts largely had run their course and that business results had started to turn the corner. The subsequent short squeeze enabled us to book an almost 53 percent gain on Windstream Holdings (NSDQ: WIN) over a 10-month holding period. And not all of this gain came from the embattled telecom’s plan to spin off some of its network assets as a real estate investment trust (REIT). Prior to this announcement, we were sitting on a roughly 35 percent gain. Aggressive Income Portfolio holding Consolidated Communications (NSDQ: CNSL) has also rallied more than 50 percent since last August, while Frontier Communications Corp (NSDQ: FTR) is up more than 44 percent. But the short sellers remain persistent. Short interest in Windstream Holdings stands at 10.6 percent, while the percentage of Frontier Communications’ float that’s held by traders betting against the stock hovers around 15 percent. In other words, short sellers remain convinced that regional telecoms’ dividends will prove unsustainable in the face of seemingly inexorable declines in revenue. However, recent results suggest that broadband sales have started to catch up to the rate of customer attrition in traditional business lines. Other short sellers bet that the Federal Reserve’s push to end quantitative easing and eventually raise interest rates will hit these dividend-paying stocks. A strong first half of the year, coupled with concerns about rising interest rates, has bolstered short interest in many utility stocks. Short interest in Consolidated Edison (NYSE: ED), for example, has climbed to almost 7 percent, or more than eight days of its average trading volume. In recent years, watching Consolidated Edison’s stock has been a good cure for insomnia. And the company’s solid second-quarter results suggest that the firm will continue to grow its earnings and raise its dividend by investing in the utility network that serves the New York City area. I’ve never been a big fan of the stock, mainly because there are better values elsewhere. That being said, Consolidated Edison is now the 11th most shorted stock in the S&P 500, despite no signs of risk to its underlying business. Short interest has also climbed in a number of other power companies. The utility sector’s most heavily shorted nameremains Hawaiian Electric Industries (NYSE: HE), with bets that the stock will lose value standing at more than 22 percent of its float. But recent developments suggest that short sellers could feel the squeeze in coming quarters. This week, the utility announced an ambitious plan tying its future to increasing use of renewable energy and reducing the state’s dependence on imported oil for generating electricity. Regulators are expected to issue a ruling on this proposal by the end of the year. But the plan appears to be in line with regulators’ goals and would ensure the company’s financial future. The huge short position against Hawaiian Electric Industries reflects a bet that the company will fail to reach an amicable deal with regulators, forcing the utility to slash its dividend. The utility’s solution of promoting rooftop solar and investing heavily in improvements to its power grid isn’t transferable to any other state. Approval of Hawaiian Electric Industries’ proposal would deal a severe blow to the bear case against the stock and could trigger a serious short squeeze. When will the shorts be right? When the bull market starts to wind down, short sellers will book gains even on stocks without deteriorating fundamentals. And the profits on names that face real challenges will be sizable. One stock in my Utility Report Card that appears ripe for a fall: SolarCity Corp (NSDQ: SCTY), a company that has posted huge revenue growth—and widening losses. Meanwhile, the competition in rooftop solar continues to intensify. Although the stock has pulled back more than 20 percent from its 52-week high, this momentum-driven name still trades at almost 28 times sales. At this point, short interest in SolarCity has reached 23.6 percent of its float. Until investors’ passion for solar cools off, these bets against the stock create the potential for a major short squeeze. In this case, the bet path is to steer clear of this overhyped name.